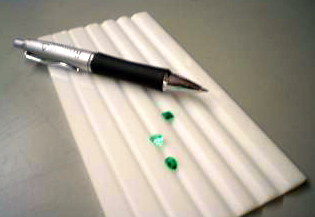 Can you measure the color of diamonds, gems, pearls and other precious stones? I have presented the stone at the entrance of the reflection port, using the small area of view. In fact, the stone was placed just inside the sphere. It gave somewhat stable results, but did not perfectly correlate with the assigned stone color. Measuring the color of precious stones is extremely challenging. There is a definite a need for objective, consistent color measurement of diamonds, gems, pearls and other precious stones for commercial grading purposes and verifying color uniformity in a set. Typically highly refractive facets throw reflect and refract light in all directions. Stones vary from translucent to transparent trapping light within the stone. Gems of greatest value tend to be very small and variable in size, making them difficult to place consistently at the measurement port. In many cases the color differences are very slight, requiring a highly precise measurement to distinguish subtle differences. In addition, measurements have to be correlated to existing highly subjective visual grading systems made with the stones viewed under high magnification. Although they are more uniform in shape and translucent in nature, pearls are equally difficult to measure for color as the geometric characteristic of pearlescence is added to the challenging sample color issues. While the application is appealing (“Diamonds are a girl’s best friend”), the challenging optical characteristics of the gems, pearls and other precious stones make this application one of the few that current colorimetric instrumentation may not be successful. If the samples are large enough, relatively uniform in shape and translucent, using a diffuse d/8 sphere instrument with a small viewing area is the best approach. The key to success is first getting a repeatable measurement. Correlation to visual grading is the next step.